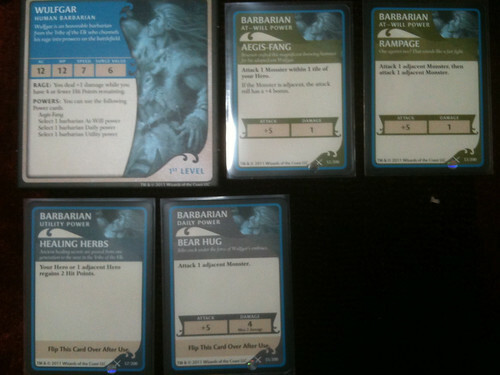 Wulfgar – low AC, but a lot of hit points. Low bonus on At-Will powers, but he can get angry with +1 damage on all hits when he’s at 4 hit points. But then again…. Drizzt – rather talented, with two attacks with fairly cool weapons with somewhat low attack bonuses and a stance that can reduce damage. Wulfgar could have used a stance power, but I’m going to assume Wulfgar isn’t the brightest hero in the world. Regis – I like that, when he’s going to draw monter cards, he gets to draw two and pick one. This is wonderful for avoiding trolls, which you very much want to do. His Ruby Pendant is a bit messed up: you can, on a successsful hit, hypnotize a monster to walk to another tile and damage another. Player order is, from right to left: Wulfgar, Drizzt, and Regis. 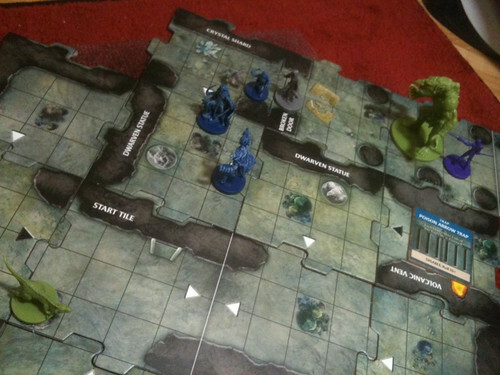 Items: Wulfgar gets Wand of Acid Arrows, Drizzt gets Spider Mask, and Regist gets Flask of Oil. Sigh. Hero Phase: Nothing but moving. Exploration: White arrow tile, Spider Swarm. 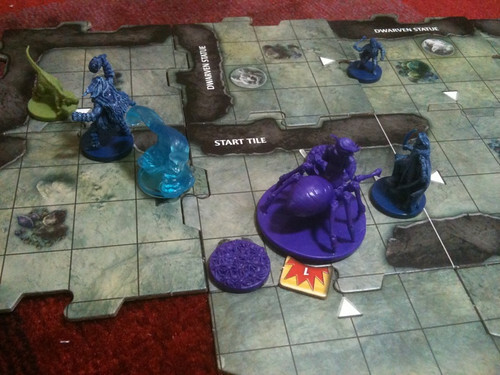 Villain: Spider Swarm moves to Wulfgar’s tile and attacks both Wulfgar and Drizzt! And this is why you want to spread out your forces. Hero Phase: Serpent moves to the spider swarm, attacks and kills it with Twinkle, placing his stance there to reduce damage from the next monster hit. He draws Bolster, and removes poison from Wulfgar. Moves. 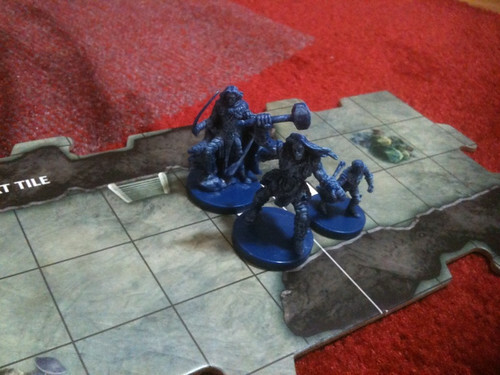 Exploration: Dwarven Statue tile (white arrow), Water Elemental. Well, crap. 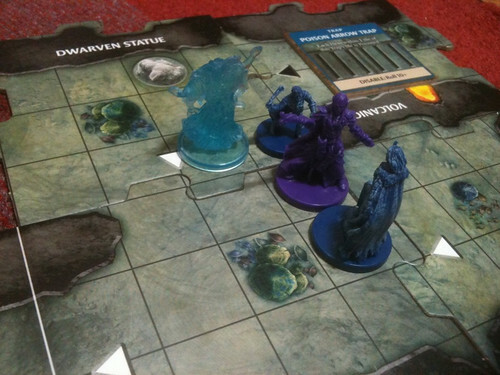 Villain: Water Elemental moves to Drizzt’s tile and attacks both him and Regis with a Surging Wave! 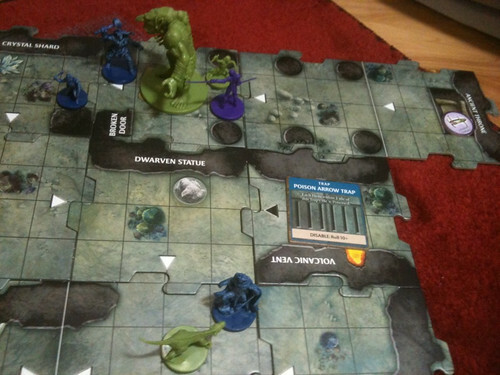 Hero Phase: Moves past Drizzt onto the farthest tile, adjacent still to the Water Elemental, and hits it twice with his mace as Drizzt is also adjacent to the monster. Hits twice to kill the monster, hoorah! Draws Follow Through, which does nothing. Sigh, fortunes can be fickle. Finally, everyone is on a separate tile, with options to move to unexplored edges and stay fairly close together in case assistance is needed. Exploration: Black arrow, Volcanic Vent. Between a Hypnotic Spirit and a Goblin Archer, he chooses the Spirit as the Spirit has less damage and a lesser attack bonus. Villain: Encounter card is … Poison Arrow Trap. Argh. This is where it starts to get bad. Spirit moves to Regis’ tile and attacks! Hero Phase: Moves to an unexplored edge. Rolls an 11 to remove the poison. Exploration: Black arrow and another Water Elemental. 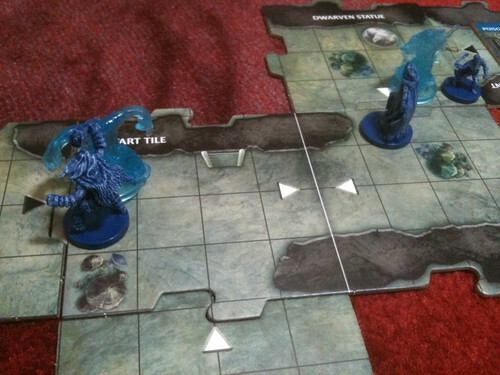 Fortunately the other Water Elemental was killed, so they won’t both be activated. Villain: Encounter card: Volcanic Vent. No one is on such a tile, so no damage is suffered (whew). 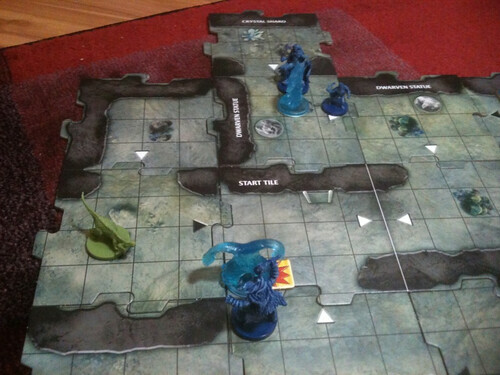 Water Elemental moves to Wulfgar’s tile and attacks with a Surging Wave! Hero Phase: Attacks the Hypnotic Spirit with Icingdeath twice, for 1 damage, killing the Spirit. Draws Brooch of Shielding, which he gives to Wulfgar because he NEEDS IT. Maybe. He moves to an unexplored edge. (not to the tile next to the Poisoned Arrow trap, which attacks all tiles within 1 tile of it). Exploration: White tile that turns into a dead end. Drow Wizard… crap. 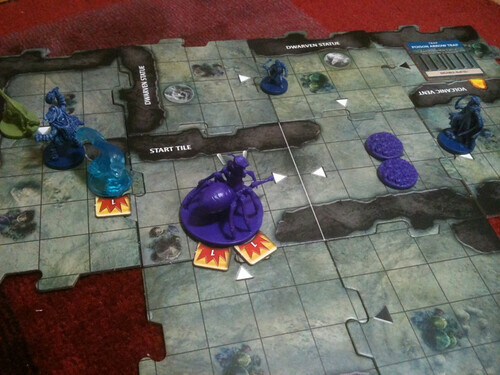 Villain: The wizard teleports to a tile with the most heroes (fortunately there’s only one hero per tile, so we can choose—and we choose poor Drizzt’s tile because Regis can then hit the wizard). The wizard hits Drizzt for 2 damage. 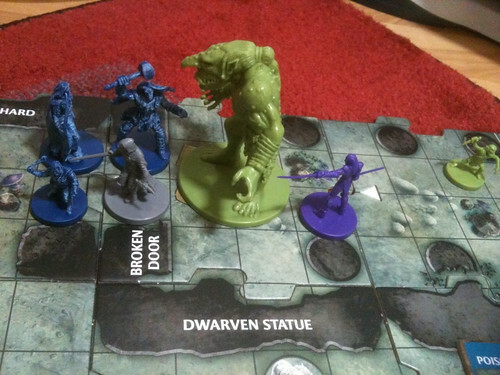 :( Fortunately Drizzt can reduce the damage by 1 via removing his Twinkle stance. Regis – 6 hp, poisoned. Uh oh. Hero Phase: Poison inflicts 1 damage. Regis hits the wizard twice for—goodness, good rolling—2 damage, killing the wizard. Woohoo! Draws Heavy Cloak and keeps it. He then moves the heck away from the Spirit, diagonally across multiple squares and manages to hit another unexplored edge. Rolls an 18 to remove the poison. Exploration: Black arrow tile, and must choose between…. Feral Troll and Hunting Party (draw 2 monsters). Well, things are quite bad now. He chooses the two monsters because… well, there’s not really a great choice here. He draws… a Hypnotic Spirit and another Hunting Party. The second Hunting Party has a Spider Swarm and a 4xp Drider, holy crap. Villain: Encounter card is Cunning Disguise. 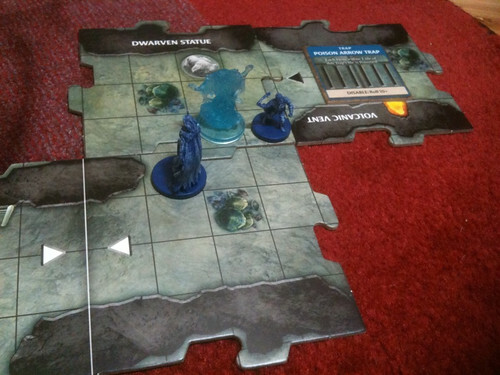 Yet another monster, this time a Drow Duelist, and Regis moves to the start tile… two tiles away from all the monsters. Yeesh. All the monsters move, with the Dueslist attacking Wulfgar twice. Hero Phase: Aegis-Fangs the adjacent Drow Duelist, killing it. Draws Potion of Healing, which he gives to Regis. 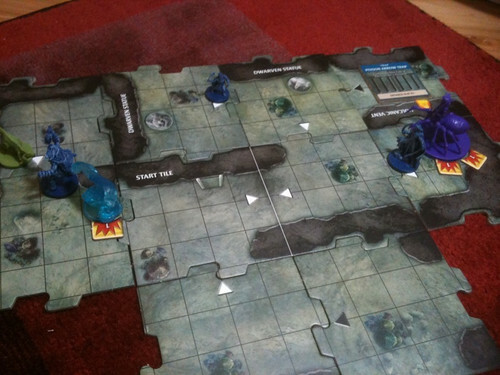 Moves to another tile (not a great time to risk the 2 damage version of the Water Elemental’s attack if he stays), and goes to an unexplored edge, maybe not the wisest course of action given all the monsters. Exploration: white curvy tile. Hooray! With a Hunting Drake on it. How adorable. 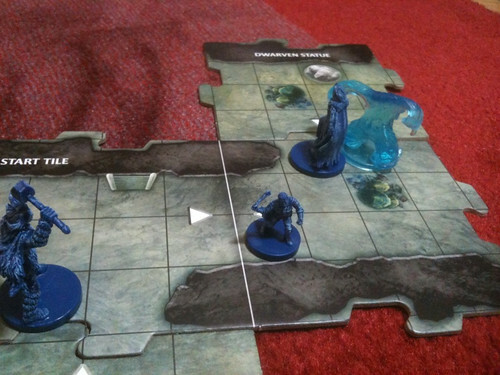 Villain: Water elemental moves adjacent, and attacks! Hunting Drake moves adjacent, and attacks! 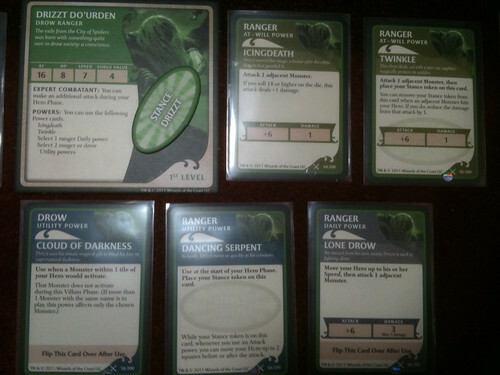 I realized that I forgot to move the Drider two tiles, not one, and to pass the Drider card to Drizzt. Rectified this. 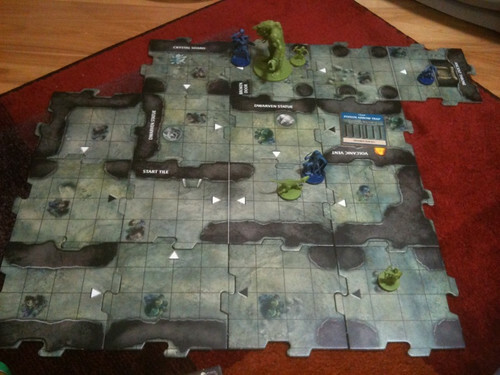 Hero Phase: Tile to (gulp) kill some monsters. Assuming that Regis can take care of the Spirit (somehow), he moves to attack the Drider. He attacks twice, once with Icingdeath for no damage, once with Twinkle for 1 damage and places his stance on the card. Villain: Encounter card is: Pursuit. Another monster, this time Spider Swarm. There might be problems. Drider attacks, the is passed to Wulfgar. Spider swarm attacks. Hero Phase: Maces the spirit and kills it. Draws a Moment’s Respite and places it on the Monster Deck so he can explore without danger. Moves to an unexplored edge. Exploration: Another Dwarven statue tile with a white arrow. Discard Moment’s Respite for no monster, whew. Unfortunately he’s within the range of the poisoned arrows and… oops. Villain: Poison arrows. Both Spider Swarms activate. 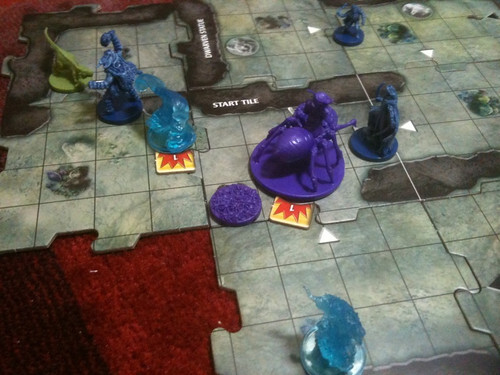 Hero Phase: Wulfgar rampages the Water Elemental for… 1 damage. Great. He decides to stay where he is. Villain: Encounter card is Volcanic Explosion which is irrelevant, phew. 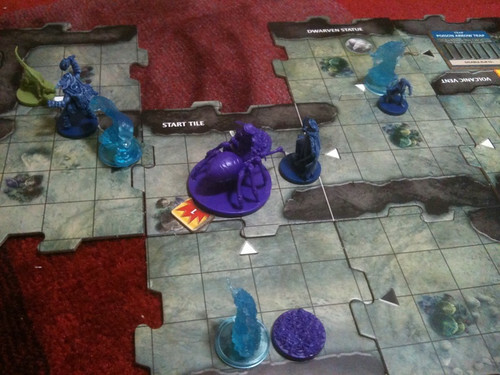 Water Elemental attacks (no damage, woo!). Hunting Drake attacks successfully. Drider attacks successfully and is passed to Regis. Wulfgar has taken 1 damage, and Drizzt 2 except that he removes a stance to reduce that damage to 1. I noticed that the Hypnotic Spirit was dead, and removed its figure. Hero Phase: Poison inflicts one damage. Attacks the Drider with Icingdeath twice for one damage. 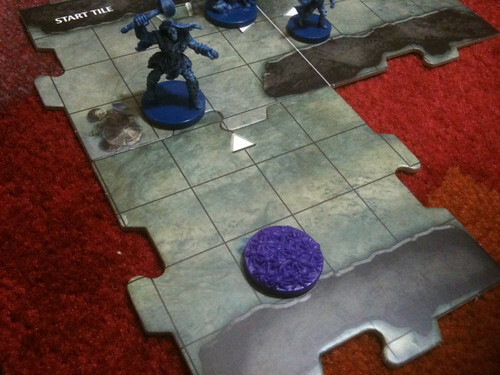 Flees two tiles away. Rolls 19 to discard the poison. Villain: Encounter card is Curse of Lolth, which is canceld by spending 5 experience points from the group pool. Sigh. Both Spider Swarms move. Hero Phase: Poison inflicts one damage. He throws a flask of oil at the spiders, killing both! Draws Belt of Giant Strength, which he gives to Wulfgar on a whim. He uses a postion of healing as well, then moves 1 space to get out of range of the poison arrows. Rolls a 1, does not get rid of poison. Villain: Encounter card is Mark of Lolth, which deals 1 damage to Regis. 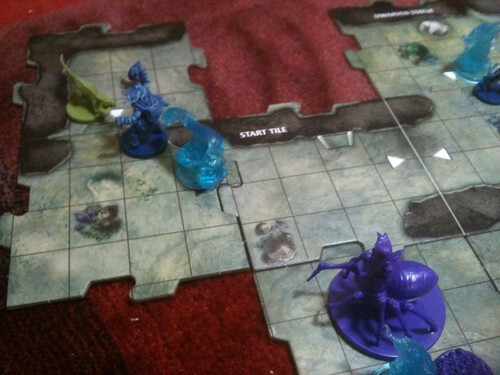 The Drider moves two tiles towards Drizzt, and uhoh. 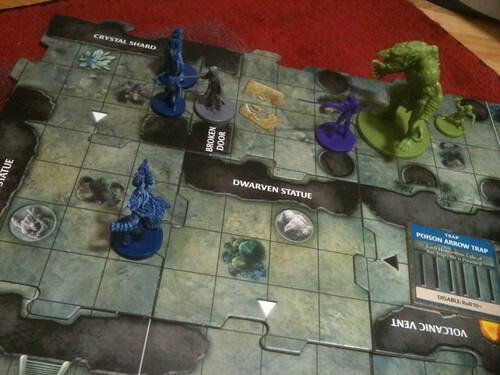 Drider is passed to Drizzt. Hero Phase: Wulfgar rampages for… no damage. Durn it. He moves to two tiles away, to an unexplored edge since things are a bit quieter now, if not all that quiet. Exploration: White arrow tile hallway with a Stalagmite, no monster. Yay! 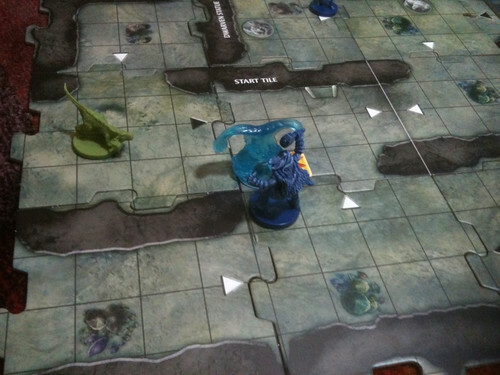 Villain: Water Elemental and Hunting Drake move closer, but don’t reach him. Yay! 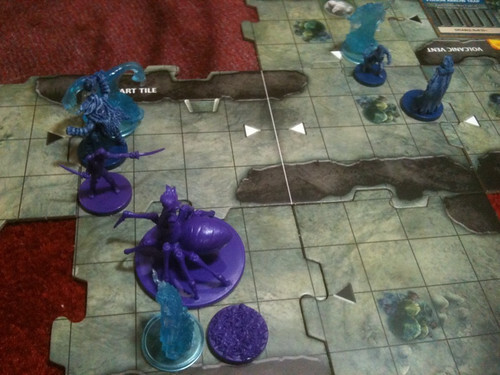 Hero Phase: Drizzt attacks with Twinkle, places his stance, and finally kills the Drider. Draws Harrowed Experience, whatever. Moves to an unexplored edge. Exploration: White arrow Crystal Shard tile, with a Hypnotic Spirit. 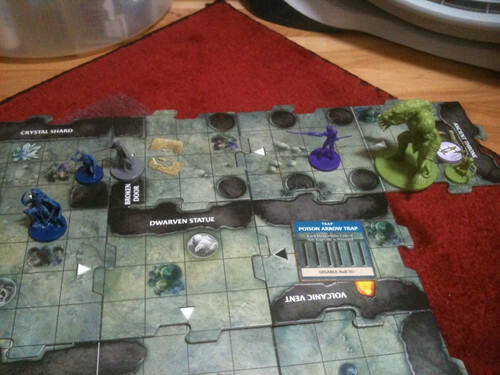 Villain: Spirit moves to Drizzt’s tile and attacks both Drizzt and Regis. Hero Phase: Poison deals 1 damage. Regis maces the Spirit and kills it, drawing TUNNEL MAP! He moves to another unexplored edge. Rolls a 2 and doesn’t get rid of the poison. Next to him, he reveals… the Broken Door. Artemis is now on the Broken Door tile, with an evil smile on his face. 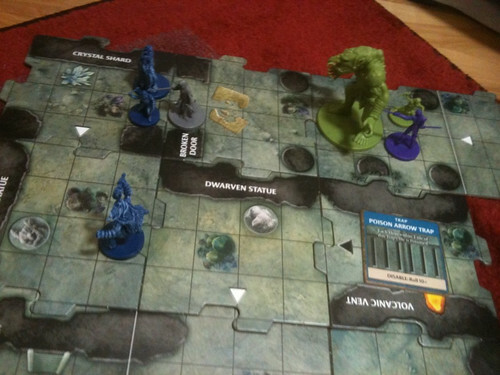 On the Ancient Throne tile, the following monsters are drawn per player: between a Goblin Champion and a Drow Duelist, Regis chooses the Duelist; Wulfgar draws a Hunting Drake (discard because he already has one) and then… F… a Feral Troll; and Drizzt a Goblin Cutter. Villain: Artemis fails to Saber Regis, and the Duelist moves closer. No one’s had to use a Healing Surge yet, so this is wonderful so far. Hero Phase: Wulfar Aegis-Fangs the Water Elemental and kills it. Draws Lift the Curse, and lifts the Curse of Lolth from Regis, who could use the luck. He then begins to speed towards his friends. Villain: Encounter card is Ancient Device, which is so canceled by 5xp. Hunting Drake and Troll move. Well, crap. We’ve got a regenerating troll and Artemis, who also has regeneration after a fashion, on the board. Um um um. Hero Phase: Moves to attack Artemis so that Regis isn’t alone against him, and thus Aretmis will be too preoccupied to use his vampiric dagger. He attacks withing Icingdeath twice. He manages to roll an 18 and thus deals two damage to Artemis. Villain: Encounter card is Volcanic Spray, which does nothing as no one is near any volcanic vents. Artemis sabers at Regis successfully. Cutter moves. Hero Phase: Poison deals 1 damagge. Regis maces Artemis twice for 1 damage. Rolls a 19 to remove poison. Villain: Encounter card is another Volcanic Spray, yay. Artemis sabers at Regis for 1 damage. Dueslist moves closer. Hero Phase: Wulfgar goes in bravely, and Aegis-Fangs Artemis successfully, and uses his Belt to deal 3 damage. Villain: Encounter card is Volcanic Spray again. Artemis sabers at Drizzt for 1 damage. Drake and Troll move. Hero Phase: Icingdeath first, dealing 1 damage to Artemis, then Twinkle with stance for 1 more damage, taking Artemis out of the game. He dances away from the troll. Villain: Encounter card is Stale Air, which is so canceld with 5xp. The cutter moves. Someone’s going to have to get that crown. 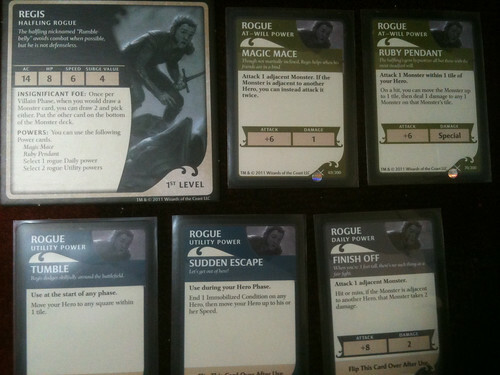 Hero Phase: Regis ruby pendants the Cutter which then stabs the Duelist, killing him. Remote kill yay! Draws a Scrimshaw Charm (sigh). Regis then zips around the troll, heading towards the Throne and victory. Then he Sudden Escapes, and ends up next to the Throne, picking up the Crown. Now everyone can RUN from the dungeon! Anyway – I love reading these, and I hope you do more of them in the future! I’m always glad to help an addiction! Wait, that sounded wrong. Or very right. I suggest Legend of Drizzt if you’re only going to get one. It’s the best of the series. Though the others are great too, it’s LoD that’s incorporated all that the designers learned from doing the first two. I hope to do more! According to the rules for Adventure #2, isn’t Artemis supposed to appear on the Start tile, not the Broken Door? Also, is awarding of treasure to other characters in the rules? I’ve been playing that the character who gets the kill gets the loot, and it’s not tradeable. Yes, Artemis is supposed to appear on start tile, and yes you can give another hero your treasure card, but only immediately after the card is drawn. If a hero keeps the treasure thereafter, he cannot give the treasure to another hero later in the game. I own all three and agree that while all three are fantastic, LoD is the best thus far!